Although primarily a consumer device, the iPad has cut itself out a role in many workplaces and as a result, many of us now cart round a laptop and a tablet to get the job done. A lot of the iPads you'll see in use around the office are people's own that they have brought in to augment the functionality of the devices provided by the boss. A typical work laptop is still pretty cumbersome and not great for taking notes at meetings (who wants a 14" screen sitting between them and their colleague or client?). The iPad is fantastic in this space, but can't run those enterprise applications that need Windows, a keyboard and a mouse. Wouldn't it be great if there was a device that was awesome at being a tablet, but could also replace your laptop? Well, Microsoft are claiming they have solved the problem with the Surface Pro 3. Sitting confidently at the premium end of the market, the 12" tablet with optional keyboard accessory runs Windows 8.1 and has an enterprise friendly intel chipset under the hood that your IT Department will be much happier managing for you than they will an iPad or Android tablet. But who cares about your IT Dept? (Well, I do, I am one of them) The important question is, can the Surface Pro 3 do a full day's work, meeting all the power-user abilities of a laptop with the accessibility, portability and noteability that the shiny iPad muscled in with? I begged a friend and pinched his to spend the day with and here's how I got on. Normally at work I run a pretty stock Dell desktop computer, which needs a bit of time to warm up in the morning, providing the perfect excuse to nip off and grab a coffee to keep me awake once the emails have downloaded. Disappointingly, the Surface was ready to go in mere seconds, but who needs an excuse for coffee? Cappuccino in hand, I got to work. The 12" screen is a joy to behold and the super high 2160*1440 resolution makes text look pin sharp. Microsoft Outlook 2013 never looked so good and viewing multiple calendars etc to plan my day around the team's availability was as easy as sitting at my desktop. Coffee and emails finished, time to draft a project brief in Microsoft Word. A few paragraphs in, I was pleased I wasn't fighting the keyboard, known as the 'type cover' as much as I did on the original Surface. It was always a marvel how thin and light it is and this time round, there is enough travel and feedback on the keys to get a bit of speed up. The mousepad is improved too. It's larger I think and the multi-touch for zooming and scrolling around whilst using desktop applications is smooth and responsive. On your lap, the keyboard can be raised and hugs the bottom of the screen-bezel. This firms up the joint, but I'm still not convinced it's as comfortable as laptops of a similar size. Still, it's nice to have the option. Microsoft Lync is a fantastic tool for the office allowing you to keep in-touch with colleagues wherever you happen to be, without having to resort to email the whole time. Think Skype, but you don't have to hide it from the boss! Whilst I'm writing, I have a few chats coming through from team-mates. At my desk I have the luxury of three monitors, but it's good to note that the built in mic, speakers and camera do a great job for ad-hoc video conferences and voice calls. My meeting is on the other side of campus, so it's time to lug the Surface out of the office to see how it feels in transit. Usually, I'd take an iPad, but this time I need Excel, so a big Dell laptop would have been sought out. At 652g, my iPad 3 weighs notably less than the Surface at 800g. But in the hand, it's certainly not causing the pain that my bag-of-bricks laptop does and it does have a bigger screen than the iPad. Super high resolutions aren't just for pretty pictures. Excel spreadsheets benefit too. That lovely resolution comes into its own during the meeting. You can never have too much when viewing big Excel spreadsheets and working through it with two colleagues presents no problem whatsoever. Again, the fast wake up from sleep means no wasted meeting time and the easy connection to the company network drives mean we can pull in some other files as we need them. However it's not all roses as I note that the screen is very reflective and it's hard to position the Surface so that it's not reflecting light from a window, or from a ceiling light. I remember the original Surface had a kickstand that saw it sit at only one angle that I found too steep. the Pro two added a second angle, but the Pro 3 gets it right by allowing you to angle the screen at near enough any angle. Still, the reflective screen is definitely a bit of a bother. Despite being a geek, normally my lunches are spent outside getting a walk in with friends, but today I thought I'd see how the Surface performed in leisure time. After all, the iPad is a lovely device for reading from and there are a wealth of games to play, movies to download and so on. I only have an hour to mess around, so I go hunting for things to read and download a couple of games. Like the work laptop, a Surface Pro 3 is not a games machine. It probably is able to play a few proper PC games, but most people will probably see what's on the app store and stick with those. Sadly, the Windows app store is a poor cousin of Apple's well stocked portal, but I was able to find a few games I liked. In ‘Asphalt 8: Airbourne’ by Gameloft, you get to race 47 high performance cars across various settings like Venice and the Nevada Desert. Although the cars are fully licensed (allowing you to thrash dream cars like the Bugatti Veyron and Pagani Zonda), this is no simulator. This is high octane arcade thrills with mad barrel-rolls and 360 jumps possible. The colourful 3D graphics look great and everything wafts along very smoothly. It's a great game on the iPad too, but I like the fact that on Windows you can use the keyboard to control the cars, or any PC games controller. Another racing game I also go for is Reckless Racing Ultimate. Again, it's all 3D arcade fun, but this time the camera is high up in the sky and you look down at your car as you powerslide round corners, upgrading your car with your winnings in-between heats. It's addictive stuff and will while away many a happy hour. I'd be wrong to suggest the Surface can compete with an iPad as a games device. But to fill time in a slow lunch hour, at the airport or in a hotel, there's enough to keep a casual gamer smiling. With lunchtime slipping by fast, there's just time to see what tech stories are doing the rounds online. I like to use Flipboard, which presents articles like pages in a magazine. It works beautifully on tablets and is an opportunity to detach the magnetic hinges of the type cover and kick back with the Surface in full tablet mode. Again, I marvel at the screen. The text is so sharp, but pictures almost pop out of the digital pages. Even better is the unusual move Microsoft have made with the screen's aspect ratio. These days, almost all laptops and tablets use the widescreen format, also referred to as 16:9. This is great for watching video, but held in portrait, as one might do when reading on a tablet, pages look a bit tall and narrow. The iPad sports a webpage friendly 4:3 aspect ratio (the compromise means borders on your videos), but the Surface sports a web and PDF friendly 3:2 ratio. Reading documents, websites and Flipboard in portrait on this device is fantastic and it's also the first sign that the Surface might have hit the mark it it's attempt to replace both laptop AND tablet. At only 9.1mm deep, the aluminium and glass Surface feels every bit the premium device that it is. Whilst there are fans inside (Asphalt 8 span them into life, but they weren’t a distraction), I can't hear them now and the 9 hours battery life claim for web-surfing means I could stay online until it's time to go home. Sadly lunchtime is over and there is work to be done. Our CIO is briefing the entire department and 100 of us traipse over to the large meeting room to hear what the new boss has to say. The pen recognises pressure, so can be used to draw as well as scribble. My stickmen failed to make the cut I'm afraid. As the chatter dies down and the PowerPoint up on the projector springs to life, I look around to see all my colleagues primed with pen hovering over paper. Not me though. No, I have stylus hovering over Surface! The Surface Pen is an active stylus with a purple button on the top. I use an Adonit Jot Pro with my iPad and it makes for a very satisfactory note taker, but the Surface is designed for this and it shows. A double-press of the purple button and the Surface has sprung into life and opened OneNote with a fresh page for me to scribble on. The experience of writing on a screen lives or dies by two things. The first is wrist rejection. You do not want that super-responsive touch-screen reacting to your wrist, every time you settle down to write with the pen. The Surface knows when the pen is nearby, even before the nib has made contact with the glass, so the Surface appears to magically know when to react to touch and when not to. Second, there should be no lag between your scribbles and the digital ink that appears. If the computer can't keep up, it'll feel weird and you'll go back to trusty old paper. Fortunately the Surface Pro 3 can. I took three pages of notes whilst listening to our new CIO speak and the Surface performed admirably, allowing me to concentrate on the job at hand. Project work in IT is great fun. You're at the cutting edge of technology, learning and implementing clever new tools that enable you to do things that you couldn't before. However, no matter how senior you are, if you're a techie, you'll likely end up logged onto the helpdesk system, clearing some support tickets. This is where iPads just cannot help you and really, a desktop or a docking station for your PC is best. Big monitors please and two is better than one. Whilst the Surface as a tablet cannot match an iPad in terms of the amount of apps available. I've found that the ones I use most commonly have now started to appear and back at my desk needing Windows, the intel i5 processor and solid-state hard drive are keeping things flying along as I get into the drudge work. Those big screens don't have to go to waste either, as the official docking station, quite a cool looking piece of hardware in its own right, will connect you up to a full sized keyboard, mouse and a couple of screens. For those of you who need more network speed than WIFI can offer, there is also Ethernet. It's the end of my day using the Surface Pro 3 as my primary office tool. So how did it do replacing my trusty laptop and iPad? The answer is incredibly well. Microsoft often pitch the Surface against the MacBook Air and although I'm not sure it will convert the Apple fan, I do think it packs a punch and some people would find it hard to choose. True, it's not as comfy on the lap (which may be a dealbreaker for some), I find the removable keyboard and stylus more than compensatory. As Windows 8.1 improves I also find that it's no longer quite so jarring switching between traditional desktop applications and tablet apps, especially as the keyboard has been much improved over past attempts. I don't care how many colours you come in, you're too expensive! With a starting price of £639, things look pretty reasonable until you discover that the keyboard is extra and another £109. The wide choice of colours in no way helps to justify the cost and the 64GB hard drive, with only 22GB available (Windows uses up the rest) means that the base model represents questionable value. I really like the Surface Pro 3 and it's a very successful design, but it's hard to recommend to consumers over an iPad and I don't think it will tempt away any MacBook Air owners whilst the public love for Windows 8 remains almost non-existent. 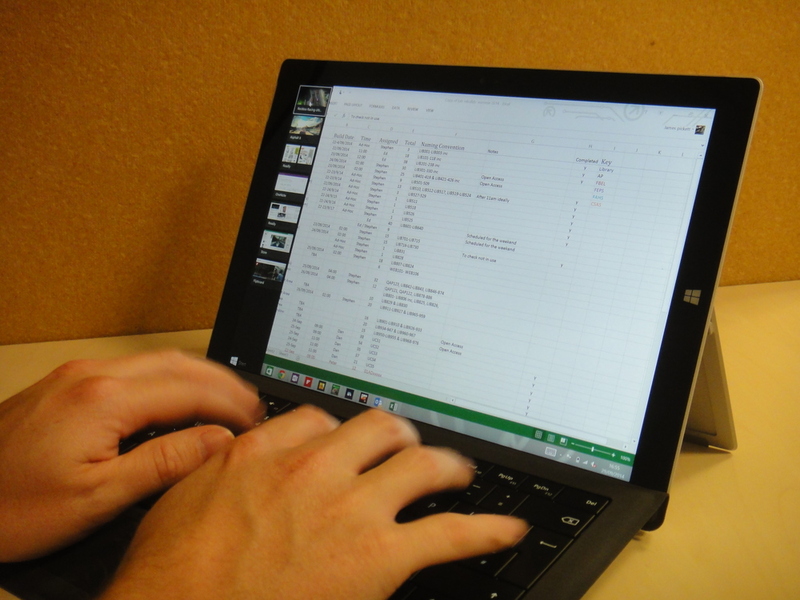 As a business or power-user purchase however, the Surface Pro 3 may well make sense. Where employers are finding themselves forced to buy their staff iPads and laptops, this device could potentially save a lot of money. It's premium enough to compete in boardroom status wars, functional enough to perform the role of tablet or PC and your IT Department won't have to spend a fortune buying all the kit needed to manage Apple and Android gadgets. Microsoft really need to throw in that keyboard for free though and who can justify over £60 for a power supply?? As I climb into bed and have one last glance at the iPad, I decide that I'm not ready to part with it just yet. It's too good a device at home and helps me out at the office. When it's time to upgrade though, the choices just got a little more complicated. The Surface Pro 3 is the most successful laptop/tablet hybrid I've used yet.